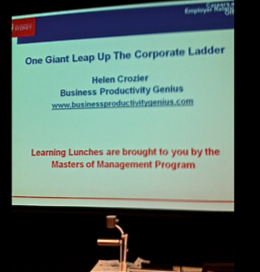 "Master of Management students recently attended a series of Learning at Lunch workshops as part of the program’s One Giant Leap campaign. Designed to give students a competitive edge, the workshops ran over three days and featured high-profile guest speakers. Students were treated to practical presentations on the topics ‘One giant leap into an interview: how to make your resume leap out from the pile’, ‘One giant leap into a corporate role: tricks and tips for the interview process by Deloitte’ and ‘One giant leap up the corporate ladder: an in-depth presentation on LinkedIn and advancing your prospects via social media’. Business productivity and social media expert Helen Crozier gave an in-depth presentation on advancing career prospects via social media, where students learnt the importance of creating a productive LinkedIn profile and were given great advice on how to use related applications. The lunchtime lecture series provided valuable insights into the corporate world, great networking opportunities and all the support students need to get the most out of the Master of Management program". Newer PostSEAN GROBBELAAR: "I highly recommend Helen..."
Older PostJUDITH CANTOR: "definitely the 'go to' person for technology"